Aquaculture has been called upon to become a more relevant source of food for humanity since the stagnation of global fisheries’ landings. However, aquaculture faces several environmental challenges such as the spread of diseases, use of different chemical compounds to treat diseases and parasites, escapes, interaction with wild organisms, and the release of organic and inorganic wastes, among other relevant environmental issues. In different regions were aquaculture has developed, these environmental risks generated controversies among different stakeholders. Several developments have been proposed to deal with and reduce these environmental impacts. For example, aquaculture production could be done in a self-contained or land-based system; however, these technologies open other avenues of concerns, such as a higher energy demand. To deal with organic and inorganic waste, there is long-term scientific evidence that these materials could be recycled by using live organisms that can use and transform these wastes into another valuable crop. In this context, the elimination of inorganic nitrogen products by finfish aquaculture (e.g. 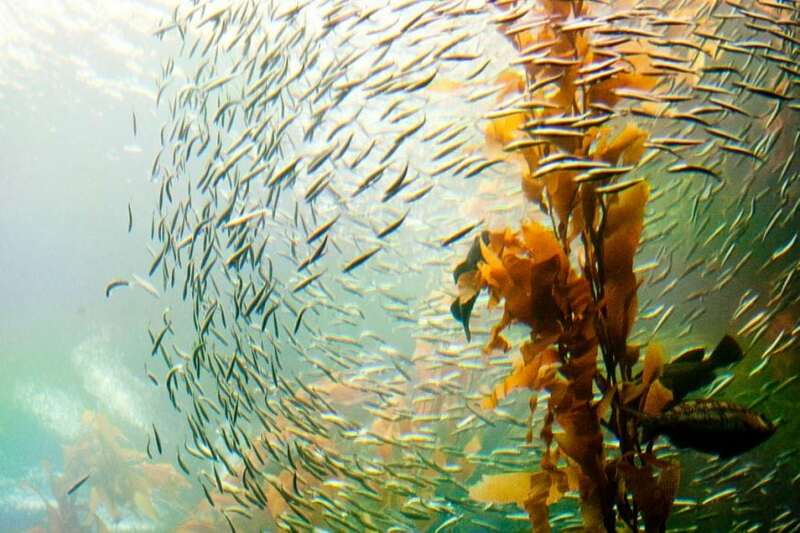 salmon), a limiting nutrient for farmed algae, could allow for the production of seaweeds while reducing nitrogen loads in the water. In oriental countries, seaweeds have a high value as food (e.g. nori for sushi and brown algae, such as wakame, used in different traditional dishes). Today, seaweeds are becoming more and more valuable in the western world not only as food but also as ingredients for different feed products, biomass to extract valuable compounds used in the food and pharmaceutical industry, and several other uses. Chile has become the second-highest salmon producer globally with a total landing during the past years of over 700,000 tons. This amount of production of a carnivorous fish eliminates a large amount of inorganic nitrogen (e.g. ammonia) that can be utilized by seaweeds. By harvesting the seaweed, we can have a valuable biomass and reduce the impacts of this excretion product in the water column. The use of algae cultivated near finfish-growing systems requires, however, the knowledge of how the algae respond in these environments and how species that have different physiological requirements interact and can be cultivated in the same environment. Therefore, this knowledge gap imposes an understanding of the photosynthetic capacities of the algae and how they use the nitrogen source made available by the fish. By using a field experimental approach, we demonstrated that we can have an enhanced growth of the brown algae Macrocystis pyrifera, commonly called giant kelp, in a suspended culture system located near a commercial salmon farm. By studying the photosynthetic and nitrogen uptake at three culture depths, our study was able to demonstrate that the maximum growth response was at intermediate depths (3 m) as opposed to near the surface (1 m) or at a deeper culture level (6 m). At 6 m depth, light limitations were detected, whereas the giant kelp growing at 1 m depth responded to high irradiances, especially in late spring and summer, where they were more intensely exposed to the decay of photosynthesis than individuals from other depths. On the other hand, although both nitrogen uptake and the enzymatic activity responsible for the nitrogen uptake varied seasonally, increasing significantly in spring and summer, these variables were not affected by culture depth. 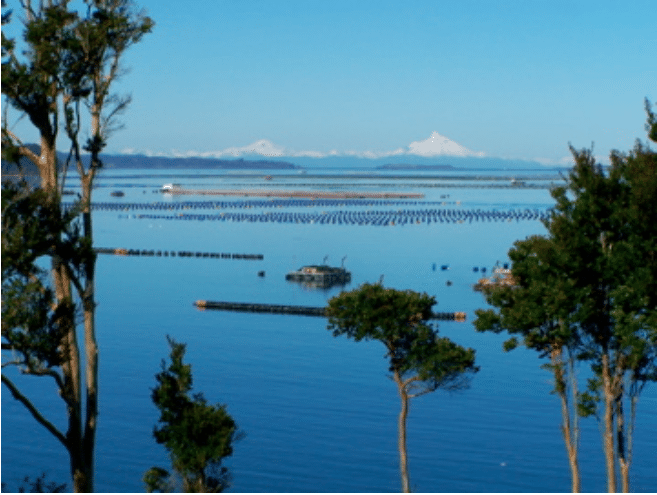 Therefore, the optimal culture depth for cultivating this alga near salmon farms was established by integrating the nitrogen supply and demand, which is modulated by plant acclimation to seasonal changes in light and temperature. These results allowed us to propose the use of this alga to improve the understanding of its aquaculture and to contribute relevant information on the use of this species for production and bioremediation. 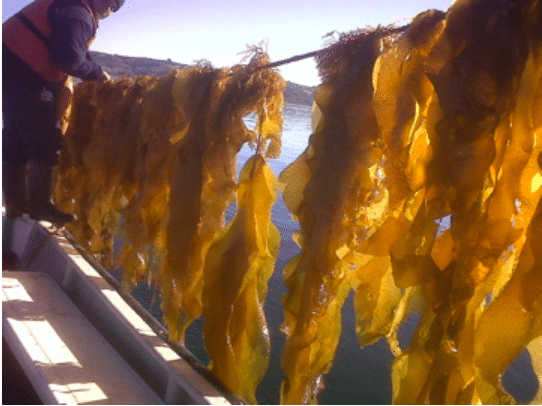 These findings are described in the article entitled Photosynthesis and nitrogen uptake of the giant kelp Macrocystis pyrifera grown close to salmon farms, recently published in the journal Marine Environmental Research. This work was conducted by Dr. Daniel Varela, Luis A. Henríquez, L.A., Pamela A. Fernández, Pablo Leal, María del Carmen Hernández-González, Félix López Figueroa* and A.H. Buschmann from the Universidad de Los Lagos located in Puerto Montt, in southern Chile (*Universidad de Málaga, Spain).